Rick and Morty have taken the world by storm and now you can get your very own portal gun to explore the deepest corners of space! 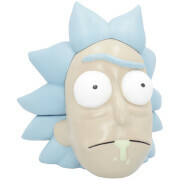 How are you going to find that special szechuan sauce without a portal gun? Pull the trigger and watch this toy gun emit a variety of lights and noises! This full-size roleplay Portal Gun is primarily used for travel, but don’t be afraid to use it offensively or defensively to avoid your enemies.